Received: April 23, 2018; Revised: November 5, 2018; Accepted: November 6, 2018.; Published online: February 5, 2019. Optimal graft selection for coronary artery bypass grafting (CABG) in patients with severe left ventricular (LV) dysfunction remains debatable. We report an analysis of our experiences of isolated CABG in patients with severe LV dysfunction and the impact of graft strategy on long-term outcomes. We analyzed 209 patients with severe LV dysfunction (ejection fraction [EF] <30%) who underwent primary isolated CABG. Of these, 169 were revascularized with a bilateral internal thoracic arterial (ITA) graft (BITA group) and 40 were revascularized with a single ITA graft (SITA group). The mean follow-up duration was 22±32 months. There were 18 early deaths (8.6%). Overall survival at 5 years was 66.7%. The rate of freedom from cardiac-related death at 5 years was 74.1%, and was significantly higher in patients who underwent off-pump CABG (p=0.005) and in the BITA group (p=0.023). Multivariate analysis demonstrated that old age (hazard ratio [HR], 2.548; 95% confidence interval [CI], 1.134–5.762; p=0.024), off-pump CABG (HR, 0.245; 95% CI, 0.090–0.661; p=0.006), and BITA grafts (HR, 0.333; 95% CI, 0.146–0.757; p=0.009) were correlated with cardiac mortality. CABG in patients with severe LV dysfunction (EF <30%) showed reasonable long-term outcomes. The rate of freedom from cardiac-related death was significantly higher in patients who underwent off-pump CABG and in the BITA group. Off-pump BITA grafting strategies can be accepted as a viable primary option in patients with severe LV dysfunction if performed by an experienced surgeon. Severe left ventricular (LV) dysfunction has become more common in patients with coronary artery disease, and remains a significant risk factor for cardiac mortality after revascularization [1–3]. Based on a multicenter trial demonstrating the long-term survival benefit of coronary artery bypass grafting (CABG) in patients with severe ischemic cardiomyopathy, CABG is currently considered the standard of care in patients with ischemic LV dysfunction [3,4]. However, surgical strategies for LV dysfunction can vary across institutions and surgeons because of conflicting evidence, especially in terms of graft selection and the use of off-pump techniques [5–7]. Several studies have described advantages of bilateral internal thoracic artery (ITA) grafting in terms of better mid-term results and acceptable operative risk [8,9]. However, the benefit of bilateral ITA (BITA) grafting has not been well demonstrated in patients with severe LV dysfunction. 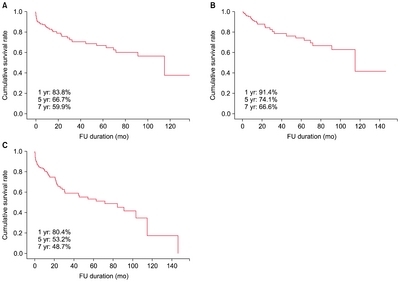 Most previous studies included patients with moderate LV systolic dysfunction (30%< ejection fraction [EF] ≤40%), whose prognostic characteristics might be quite different from those of patients with an EF of 30% or less [6,10]. In this study, we report 15 years of institutional experience with isolated CABG in patients with severe LV dysfunction (EF ≤30%) and present recommendations on the optimal strategy by analyzing the effects of graft selection and use of the off-pump technique on long-term survival outcomes. This retrospective study was approved by the Institutional Review Board of Sungkyunkwan University and patient consent was waived based on the nature of this study. From January 2001 to December 2014, 3,730 consecutive patients underwent isolated CABG at Samsung Medical Center. We included patients who were preoperatively identified as having severe LV dysfunction (defined as an EF <30% in the LV). We excluded patients who underwent a concomitant valve or other major cardiac operation. We excluded patients who were revascularized with only a vein graft. Finally, 209 patients (aged 62.0±12.0 years, 30 women) were identified and reviewed in this study. We divided the study population into 2 groups: 169 patients revascularized with a BITA graft (the BITA group) and 40 patients revascularized with a single ITA graft (the SITA group). A SITA was used for the following indications: (1) if the proximal right coronary artery had between 75% and 90% stenosis, (2) if the right ITA (RITA) was too short or would be traumatic to use, or (3) if vital signs required reduction after graft harvest. All patients underwent operation through a standard median sternotomy. Off-pump CABG (OPCAB) with full skeletonization of the ITA was the primary strategy, as previously described . On-pump CABG was performed in cases with severe hypertrophy, because OPCAB is technically challenging, and extracorporeal membrane oxygenation or an intra-aortic balloon pump is needed before surgery. BITA grafts were commonly performed as Y-composite grafts, composed of an in situ graft of the left ITA (LITA) and a free graft of the RITA. In general, the left anterior descending territory was revascularized with a LITA, and a sequential RITA graft was used for the circumflex territory. The distal extension of the RITA was typically anastomosed to the right coronary artery and branches. If an additional graft was required, a saphenous vein graft was preferred in cases of low-grade stenosis (≤90%) of the right coronary artery. We grafted all significant lesions larger than 1 mm in diameter. Early outcomes included clinical events that occurred within 30 days postoperatively, and late outcomes included events that occurred later than 30 days postoperatively. Cardiac death was defined as in-hospital mortality, death from myocardial infarction (MI) or heart failure (HF), and sudden death. Cardiac-related events included cardiac death, MI, HF, coronary reintervention, and hospitalization due to cardiovascular causes. We defined postoperative stroke as a neurologic deficit that was unresolved for more than 24 hours and documented with neuroimaging. Acute kidney injury (AKI) was defined as a documented history of renal failure with a serum creatinine level greater than 1.5 mg/dL in patients without preoperative renal impairment and as a postoperative increase in serum creatinine of at least 1.0 mg/dL above baseline in patients with preoperative renal impairment. Postoperative atrial fibrillation was defined as new-onset atrial fibrillation documented with an electrocardiogram that was not restored to sinus rhythm at discharge. MI was defined as a new-onset pathologic Q wave on an electrocardiogram or a peak creatine kinase-MB level greater than 50 ng/mL. Follow-up data was obtained either by regular visits to the outpatient clinic at 3-month intervals or a telephone questionnaire. Follow-up was completed on December 31, 2015. The mean follow-up duration was 22±32 months. Categorical variables were compared using the Pearson chi-square test or the Fisher exact test, as appropriate. Normally distributed continuous variables were reported as the mean±standard deviation and compared using the 2-sample Student t-test, and non-normally distributed continuous variables were compared using the Mann-Whitney U-test. We performed univariate analysis and multivariate Cox regression analysis to assess independent predictors of cardiac death. Forward and backward likelihood ratio procedures were used to determine the effects of combined factors. The Kaplan-Meier method was used to calculate freedom from overall mortality, freedom from cardiac-related mortality, and freedom from cardiac-related events. All reported p-values were 2-sided, and those less than 0.05 were considered to indicate statistical significance. All statistical analyses were carried out using IBM SPSS ver. 21.0 (IBM Corp., Armonk, NY, USA). The prevalence of acute MI was 36.8% (77 of 209), and that of triple-vessel disease was 86.6% (181 of 209). The mean EF was 23.6%. An emergent or urgent operation was performed in 28 patients (13.4%). Detailed baseline characteristics comparing the 2 groups are described in Table 1. Table 2 summarizes the operative data. The off-pump technique was used in 96 patients (45.9%), and BITA grafting was used in 169 patients (80.9%). The mean number of anastomoses was 4.5±1.3 per patient. There were a total of 18 early deaths (8.6%), including 16 cardiac deaths and 2 non-cardiac deaths. There was no statistically significant difference in early mortality between the 2 groups (5.2% in the BITA group versus 15.0% in the SITA group, p= 0.109). In terms of postoperative complications, bleeding, MI, AF, stroke, and wound infection did not show significant differences, but postoperative AKI was significantly more common in the SITA group (16% in the BITA group versus 45.7% in the SITA group, p<0.001). Postoperative MI occurred in 2 early events, and 1 of the patients died (Table 3). There were a total of 24 late deaths, including 17 cardiac deaths and 7 non-cardiac deaths. The cause of non-cardiac death was lung cancer in 1 patient, respiratory arrest due to pneumonia in 2 patients, suicide in 1 patient, diabetes mellitus complications in 2 patients, and septic shock in 1 patient. A postoperative new-onset stroke occurred in 5 patients, and 4 of the cases occurred after 30 days. A total of 20 patients were readmitted after 30 days. These patients experienced HF (n=11), arrhythmia (n=1), mediastinitis (n=1), wound infection (n=1), heart transplantation (n=1), unstable angina (n=1), and graft failure (n=2), and patients with graft failure underwent redo CABG. We performed a risk factor analysis of the entire study population to determine the effects of graft and CPB strategies on cardiac-related death, while adjusting for the effects of other variables. Multivariate Cox regression analysis revealed that advanced age (hazard ratio [HR], 2.548; 95% confidence interval [CI], 1.134–5.762; p=0.024), the off-pump technique (HR, 0.245; 95% CI, 0.090–0.661; p=0.006), and a BITA graft (HR, 0.333; 95% CI, 0.146–0.757; p=0.009) were independent risk factors for late cardiac death (Table 4). Although evidence-based therapies have been widely used, severe LV dysfunction in the setting of significant coronary artery disease is still a challenging problem [1–4]. According to the American College of Cardiology Foundation/American Heart Association (ACCF/AHA) 2013 heart failure clinical practice guidelines, either CABG or medical therapy is a reasonable treatment strategy for patients with severe LV dysfunction (EF <35%), HF, and significant coronary artery disease (class IIa, level of evidence B) . However, a recent landmark trial, the Surgical Treatment for Ischemic Heart Failure (STICH) Extension Study, demonstrated the long-term benefit of CABG in patients with ischemic cardiomyopathy . 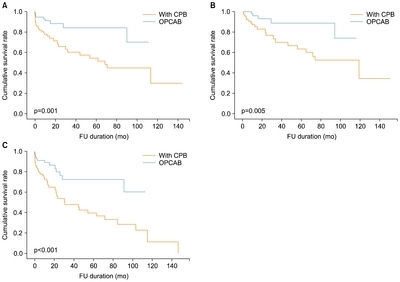 Based on these results, all-cause deaths, as well as deaths from cardiovascular events, were significantly lower in patients who received CABG plus optimal medical therapy than in those who received optimal medical therapy alone over a 10-year follow-up period. Thus, it is not surprising that CABG is part of the standard of care for treating patients with ischemic LV dysfunction who are amenable to an operation. However, the optimal surgical strategies for CABG in patients with LV dysfunction are still inconclusive, and there is currently a lack of evidence [6,10,12]. In 2012, Dorman et al. presented a propensity-matched study demonstrating that BITA was associated with better long-term outcomes in patients with a reduced EF (30% to 50%). However, they failed to show the superiority of BITA in patients with an EF less than 30% . In the same context, Gatti et al. presented similar results in their study of 300 patients with an EF less than 35%, concluding that early postoperative improvement of EF was predictive of long-term survival benefits after BITA grafting. The definition of severe LV dysfunction has been described and adopted in the literature. Since the ACCF/AHA 2013 guidelines and the STICH trial selected an EF ≤35% as the cutoff point for severe LV dysfunction, it was presumed that the same criterion (or an EF less than 40%) was arbitrarily chosen in subsequent studies [5,6]. However, according to the American Society of Echocardiography’s Guidelines and Standards Committee, severe LV dysfunction is described as an EF less than 30%, which is thought to be a common criterion in the real-world assessment of ventricular systolic function by echocardiography . More importantly, there is also evidence that patients with an EF of 30% or less are at higher risk for sudden cardiac death than patients with an EF between 30% and 40% during long-term follow-up after MI [15,16]. Therefore, patients with severe LV dysfunction (EF ≤30%) may have different prognostic characteristics from those of patients with moderate dysfunction (30%< EF ≤40%). Therefore, our study of surgical strategies for CABG in severe LV dysfunction (EF ≤30%) might represent a different perspective from that of previous studies with an EF cutoff of less <35% (or <40%). Our study subjects were unique because we evaluated the long-term outcomes or CABG in patients with an average EF of only 23%. Unlike previous equivocal results in studies that assessed patients with an EF <35% (or <40%), our results showed that BITA grafting was a distinct factor that reduced late cardiac-related mortality. Thus, we believe that the long-term protective effect of BITA grafting becomes more prominent as LV dysfunction becomes more severe. This hypothesis is supported by the lack of difference between the freedom from cardiac-related events curves of the BITA and SITA groups, despite significant differences between the 2 groups in overall mortality and freedom from cardiac-related morality (Fig. 2). Since the category of cardiac-related events included relatively mild events that do not lead to death, such as hospitalization and re-intervention, it can be assumed that BITA grafting does not provide additional benefits compared to SITA grafting in terms of reverse-remodeling or inhibition of HF progression. 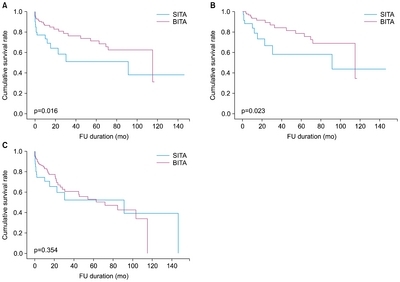 However, the BITA group showed statistically significantly better results than the SITA group based on the univariate analysis of cardiac-related mortality. Because it is well known that more severe forms of adverse events frequently occur in patients with a low EF, our results can be interpreted as consistent with our hypothesis that the effects of BITA grafting are more pronounced in patients with a more severely diminished EF. Several studies on the impact of off-pump techniques on long-term outcomes showed conflicting results [5,7,17]. Until the results of ongoing trials (the coronary artery bypass grafting in high-risk patients randomised to off- or on-pump surgery trials) are presented, conclusions about CPB strategies will remain inconclusive. At our institution, OPCAB is considered as the initial strategy even in patients with severe LV dysfunction, and we consider switching to on-pump beating or conventional CABG when hemodynamics cannot be maintained. Therefore, our results might include a selection bias for patients that have successfully completed OPCAB, who would be at a lower underlying risk. Therefore, it cannot be claimed that OPCAB has an absolute advantage over on-pump CABG based on our results. Nevertheless, OPCAB as an initial strategy in patients with severe LV dysfunction might yield acceptable outcomes. There were several limitations of our study. First, this was a non-matched, retrospective study with inherent methodological limitations. Our results might have been affected by multiple unmeasured confounders. Therefore, further well-designed matched studies or prospective trials will be required to confirm our results. Second, since the surgical strategies for individual patients were decided based on the surgeon’s preference or institutional protocols, instead of objective criteria, the findings of the present study were subject to bias. Furthermore, our study was small, with a retrospective design. Therefore, larger prospective, randomized trials will be required to validate our results. In conclusion, CABG for patients with severe LV dysfunction (<30%) showed reasonable long-term outcomes. Nonetheless, more extensive studies should be conducted, and it is important to select well-matched groups. Based on these results, off-pump BITA grafting strategies can be accepted as a viable primary option for patients with severe LV dysfunction, if performed by experienced clinicians. Fig. 1. Late outcomes in all patients. (A) Overall mortality. (B) Cardiac-related mortality. (C) Cardiac-related events. FU, follow-up. Fig. 2. Late outcomes by graft strategy. (A) Overall mortality. (B) Cardiac-related mortality. (C) Cardiac-related events. BITA, bilateral internal thoracic artery; SITA, single internal thoracic artery; FU, follow-up. Fig. 3. Late outcomes by CPB strategy. (A) Overall mortality. (B) Cardiac-related mortality. (C) Cardiac-related events. CPB, cardiopulmonary bypass; OPCAB, off-pump coronary artery bypass; FU, follow-up. Values are presented as number (%). ITA, internal thoracic artery. Velazquez, EJ, and Bonow, RO (2015). Revascularization in severe left ventricular dysfunction. J Am Coll Cardiol. 65, 615-24. Velazquez, EJ, Lee, KL, and Deja, MA (2011). Coronary-artery bypass surgery in patients with left ventricular dysfunction. N Engl J Med. 364, 1607-16. Velazquez, EJ, Lee, KL, and Jones, RH (2016). Coronary-artery bypass surgery in patients with ischemic cardiomyopathy. N Engl J Med. 374, 1511-20. Kang, SH, Lee, CW, and Baek, S (2017). Comparison of outcomes of coronary artery bypass grafting versus drug-eluting stent implantation in patients with severe left ventricular dysfunction. Am J Cardiol. 120, 69-74. Yoo, JS, Kim, JB, Jung, SH, Choo, SJ, Chung, CH, and Lee, JW (2013). Coronary artery bypass grafting in patients with left ventricular dysfunction: predictors of long-term survival and impact of surgical strategies. Int J Cardiol. 168, 5316-22. Gatti, G, Maschietto, L, and Dell’Angela, L (2016). Predictors of immediate and long-term outcomes of coronary bypass surgery in patients with left ventricular dysfunction. Heart Vessels. 31, 1045-55. Ueki, C, Miyata, H, Motomura, N, Sakaguchi, G, Akimoto, T, and Takamoto, S (2016). Off-pump versus on-pump coronary artery bypass grafting in patients with left ventricular dysfunction. J Thorac Cardiovasc Surg. 151, 1092-8. Lytle, BW, Blackstone, EH, Sabik, JF, Houghtaling, P, Loop, FD, and Cosgrove, DM (2004). The effect of bilateral internal thoracic artery grafting on survival during 20 postoperative years. Ann Thorac Surg. 78, 2005-12. Kelly, R, Buth, KJ, and Legare, JF (2012). Bilateral internal thoracic artery grafting is superior to other forms of multiple arterial grafting in providing survival benefit after coronary bypass surgery. J Thorac Cardiovasc Surg. 144, 1408-15. Cho, SW, Lee, YT, and Sung, K (2006). Early and midterm results of coronary artery bypass grafting in patients with ischemic cardiomyopathy (LVEF39, 604-10. Yancy, CW, Jessup, M, and Writing Committee Members (2013). 2013 ACCF/AHA guideline for the management of heart failure: a report of the American College of Cardiology Foundation/American Heart Association Task Force on practice guidelines. Circulation. 128, e240-327. Mohammadi, S, Kalavrouziotis, D, and Cresce, G (2014). Bilateral internal thoracic artery use in patients with low ejection fraction: is there any additional long-term benefit?. Eur J Cardiothorac Surg. 46, 425-31. Dorman, MJ, Kurlansky, PA, Traad, EA, Galbut, DL, Zucker, M, and Ebra, G (2012). Bilateral internal mammary artery grafting enhances survival in diabetic patients: a 30-year follow-up of propensity score-matched cohorts. Circulation. 126, 2935-42. Lang, RM, Bierig, M, and Devereux, RB (2005). Recommendations for chamber quantification: a report from the American Society of Echocardiography’s Guidelines and Standards Committee and the Chamber Quantification Writing Group, developed in conjunction with the European Association of Echocardiography, a branch of the European Society of Cardiology. J Am Soc Echocardiogr. 18, 1440-63. Solomon, SD, Zelenkofske, S, and McMurray, JJ (2005). Sudden death in patients with myocardial infarction and left ventricular dysfunction, heart failure, or both. N Engl J Med. 352, 2581-8. Filsoufi, F, Rahmanian, PB, Castillo, JG, Chikwe, J, Kini, AS, and Adams, DH (2007). Results and predictors of early and late outcome of coronary artery bypass grafting in patients with severely depressed left ventricular function. Ann Thorac Surg. 84, 808-16. Keeling, WB, Williams, ML, Slaughter, MS, Zhao, Y, and Puskas, JD (2013). Off-pump and on-pump coronary revascularization in patients with low ejection fraction: a report from the society of thoracic surgeons national database. Ann Thorac Surg. 96, 83-8.